Be Inspired by the Inspiring! HomeInspire: Verb, To breathe life into. AboutAt Inspiration across Nations, we share stories about the life-giving work of individuals and non-profit organizations so that these stories can breathe life into communities around the world. Newly added Inspiring Crusader is Ashley Horner. Some of you might know this amazing woman have heard her name, some of you might google her after you read this article (maybe even before you finish, no hard feelings). I have admired Ashley for years, there is just something about her. She works hard, has an amazing physique, is open, and just as important (if not most important), has an amazing heart. I rarely get star-struck. When I saw the opportunity to meet her at an event, that might be the word one would use. When I reached out to set up time to talk with her and received a response that she actually wanted to sit down with me, that would definitely be the word I would use! Some of you know a bit about my transformation journey. I used to be very unhealthy, binge eating, trying every shortcut the industry came up with, there was over 200 lbs on my 5’6″ frame at one point. I was depressed but I couldn’t seem to get out of it. Back in 2007 I was online looking for the latest trend, I found bodybuilding.com. The women on there who did the fitness competitions were so strong and feminine, I wanted to be just like them! Right then I made a goal to get on stage at a bodybuilding competitions. I am not sure of the exact year I started following Ashley Horner but I remember seeing her on bodybuilding.com, one of the women I wanted to be like one day. She just has this way about her, she is smart, works hard, knows who she is and isn’t going to apologize for it. So empowering, dare I say inspiring! Now with a little backstory and context, we will pick up where we left off. I have followed Ashley for years and her accomplishments continue to inspire me. A couple years ago, she visited Haiti and the Maison Fortune Orphanage, she wanted to help these children. So, she took to what she knew best – trained for and ran 230 miles in 72 hours along the coast of Haiti. She raised over $64,000 for those kids, that’s over 2.5 times their goal of $24,000! First of all, what a heart! Second, 230 miles in 72 hours… talk about pushing your body! Third, raising over $64,000 for those kids… a bunch of people pulling together to show support for the orphanage, support for Ashley and the change she is making in this world. How could she not be an Inspiration Across Nations Inspiring Crusader?!? Rowing 300 consecutive miles on a Concept 2 machine for Spike’s K9 Fund. A 280 mile run from Virginia Beach to North Carolina for the Unbroken Foundation. Swimming 300 miles in one month for the Maison Fortune Orphanage Christmas fund. Cycling 1,350 miles from Virginia Beach to Tulsa, OK for St. Judes Cancer research. The event I attended was her birthday party at American Brew (a coffee/whisky/restaurant she opened) to raise money for the Unbroken Foundation (a foundation she started). Ashley created it in 2013 to aide battered women and children shelters across the United States. (Is there anything this woman can’t do? So inspiring). When she walked in, she went up to everyone in the bar (there were about 50 of us) and said hello, thanked them for coming. When I sat down to talk to her, she was so incredibly humble, so incredibly nice. We talked about many things including her strength and how there are times in our life when we feel incredibly weak, once we get through it, survive it, we realize how strong we really are. That compounds with every experience, gaining strength every time. Sometimes when you meet someone you’ve admired for so long, you don’t know what to expect. 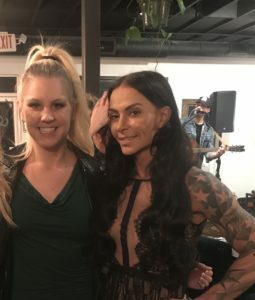 After my conversation with Ashley, I came away with this… she has a huge heart, she is humble, she works hard, she wants to make this world a better place and is using her talents to do just that. She has inspired me to go after an extreme physical challenge I have had on my mind for a few years. More on that in the upcoming weeks… There is so much more I could say but I will end by saying this… Ashley, keep doing what you’re doing. You inspire so many people, some who voice it and some who don’t. The impact you have made thus far is incredible. Be Inspired by the Inspiring. We can all use a breath of fresh air. At Inspiration across Nations, we share stories about the life-giving work of individuals and non-profit organizations so that these stories can breathe life into communities around the world. © Copyright 2018. Inspiration Across Nations. Be Inspired by the Inspiring.